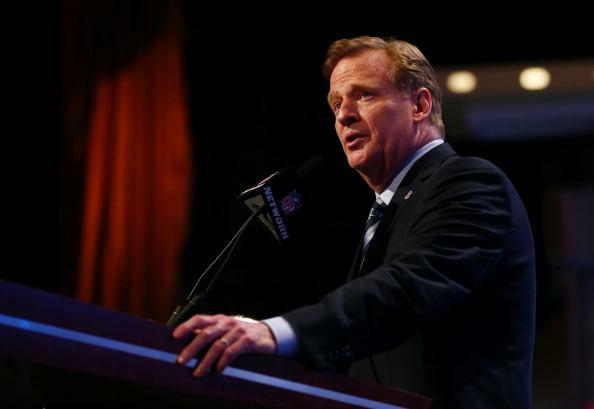 Roger Goodell, Janay Rice, falling: NFL owner says commissioner believed her story that she fell during "scuffle." Goodell at the 2014 NFL draft. In conversations about the Rice case over the summer, the owner said, Goodell privately told other owners that during his investigation, in a meeting with the Rices in June, Janay Rice said she had struck her then-fiancée and that she believed she was partly at fault for the incident. Goodell also said he left the meeting believing that Janay Rice had become unconscious because she had fallen during the scuffle. Footage from the elevator posted by TMZ this week, of course, clearly shows Janay Rice being punched hard by her now-husband, whereupon her head strikes a railing as she falls. It’s not clear that Janay Rice strikes Ray Rice at any point shown in the footage, though she does throw her left arm out in the direction of his face before they enter the elevator—though even that gesture comes after his head moves toward her in a manner that might suggest, as ESPN reported, that he was spitting on her. Update, September 11, 5:50 p.m.: It’s worth noting that an Atlantic City police summons, which has been available since February, states plainly that Janay Rice was knocked unconscious because Ray Rice struck her with his hand.